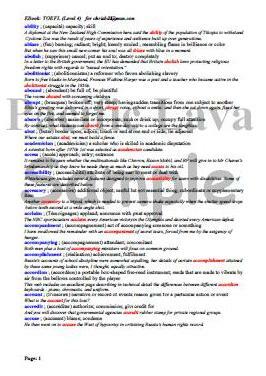 Create and print your own vocabulary from word lists of examword.com. A. Because current users have more and more free methods to create PDF files, our partner stops running PDF/RTF-related service. Therefore, we retired the old PDF/RTF feature. If you didn't use the Chrome's save as PDF feature before, this 2 minutes video instruction may help you out. C. If you want to download PDF/RTF files created previously, please contact with us before July 1st, 2019, we will send you the access link. 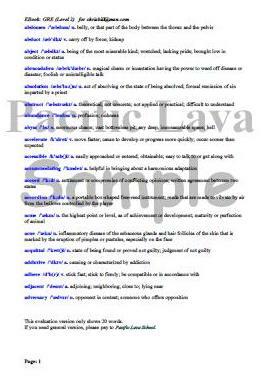 Print Vocabulary in PDF is a handy tool for English vocabulary builders to create own customized worksheets. It is based on word lists of www.examword.com, covering main English exams: IELTS, TOEFL, PTE, SAT, ACT, GRE, and etc. In addition, it also lets students to edit definition of each word, remove known word, and add own word list. By the smart and flexible tool, students can create personalized word list in minutes through powerful exam word list resources in this website. You may get some word lists somewhere, however, you hardly find one to match with your case and level exactly. Either too difficult or too easy will definitely waste your time and effort for future tests. This is why tutors always encourage students to learn the right thing at right time. One word list just for your circumstance is for the goal, and the app will help you to get it. Here we show you how to create own PDF word lists briefly. Your word list's data and final file, will be stored at cloud until you download them. The app needs sign on before starting its features. At first, you have to create an account at examword.com unless you already have one. If not, please register an account through Sign On button at page top. Here you need input an email address, it will be as account identifier, and click Register button. By the email, you will receive an access code very soon. Using both email and access code, you can sign on www.examword.com. This access code is effective for all apps of the website. You may add words to own list anytime. From Load Word page, you can see all available word lists provided by www.examword.com. Only select lists that match with your case. If you loaded something wrong, remove it, and re-load right one. The tool is very handy. Reset Content to New if Loaded Before: If didn’t load these words before, this option has no effect. If loaded, checked means original contents that you may edited something will be cleaned; unchecked means the existing words will be kept. Append Definition of My Language: Some word lists have definitions of multiple languages. If checked, your home language’s definition will be appended. Your home language is set with account, you can specify by Sign On panel. One word list usually has hundreds or thousands of words. It has been grouped with sub-lists, called items. Every time only ONE item can be selected and loaded. You can load same item multiple times, the contents will be overwritten or kept as your options. You can edit word list to match with your own level and requirement. By default the Edit Word will show all words in your list. You can also search by filter to locate the targeted words quickly. Remove All Words: If you think current list is totally not right for you, you may remove all of them. Besides updating definitions of existing words, you can add own word list too. At Load Word page, there is a button to load customized word list. It opens an edit panel. You may copy and paste your own words here, and then load them. The maximum is 200 words each time you can upload. Unlike word lists of www.examword.com, duplication checking doesn't work for words in customized list. If you load same list more than once, there is no way to overwrite original words. In this case, please maintain your word lists manually. 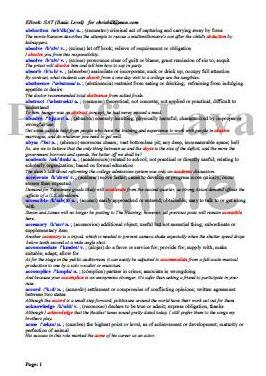 To keep the website run in high performance, we limit the word list size. After the word number is more than 300, any request to load new words will be refused. Of course, the actual vocabulary may be much bigger than 300. In this case, you cannot put all words into one file. Instead, you should divide the large vocabulary into multiple small ones that are less than 300. Then, you can create and download the PDF file. Some users are ESL, they used to add definitions of home language in word list. Because the final PDF is made by Chrome browser on your local device, if some characters of non-English cannot be displayed normally, for example, Korean or Chinese show as blank in PDF file, please install your native language on the device accordingly. The app monitors current word list automatically. As long as it finds out that the word list has any change, it will inform you to make new PDF file to download. If you need to make new files for special reason, you can open edit panel of any word from Edit Word page, and then save it without any actual update. This fake save will give you a green light to create new files. All printed PDF files' copyrights are belonged to examword.com based on the primary fact: most of contents come from source lists offered by this web site although you might edit or update more or less. We possiblly share parts of printed PDF files among tutors and students internally after filtering private information and data. Below are some samples. Want to get own edition? Try it, it's just a job of 10 minutes!